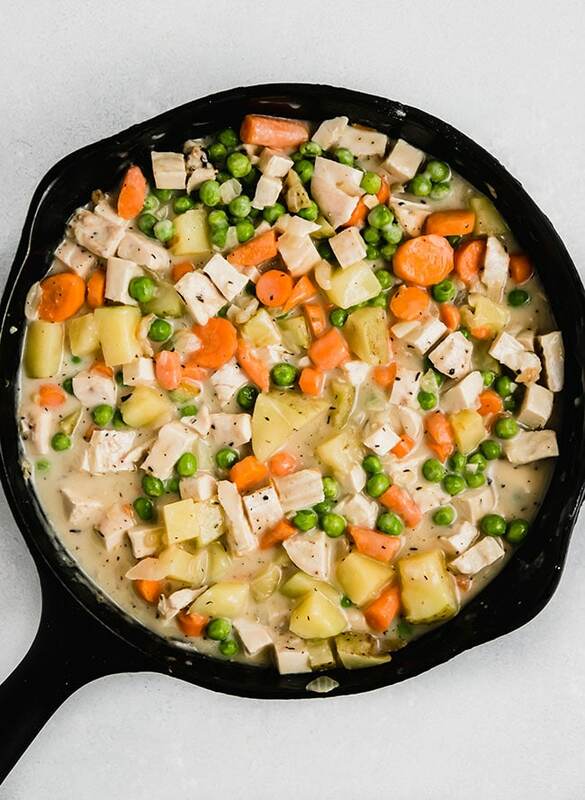 This easy skillet chicken pot pie is the perfect way to use leftover chicken (or leftover turkey after Thanksgiving!) With a quick homemade dough recipe for pot pie crust. This recipe and photos were recently updated! ’tis the season for CHICKEN. POT. PIE. 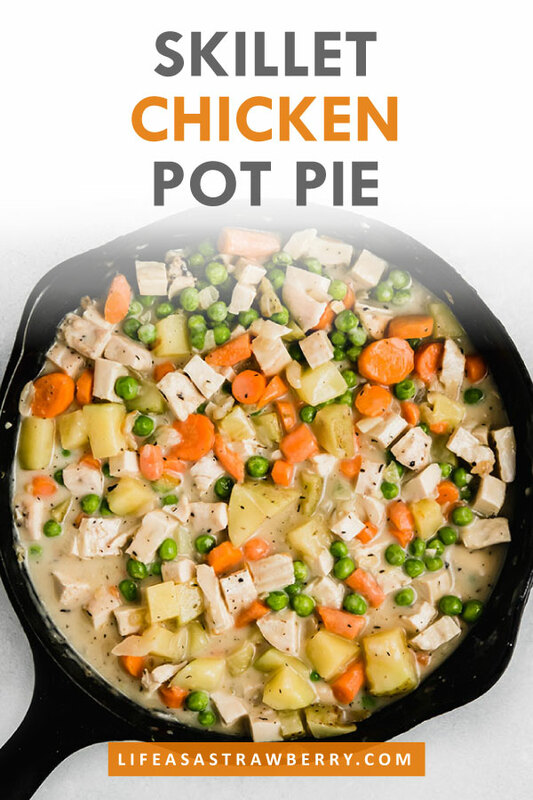 Although actually, we might as well call this recipe “stuff in a skillet with crust on top” or “basic homemade pot pie you can put pretty much anything into,” because chicken is definitely not a requirement here. I personally tend to reach for this recipe every Thanksgiving weekend, because 1) it’s delicious and 2) there’s only so much leftover turkey a girl can eat, y’know? This pot pie is my FAVORITE way to use up any leftover Thanksgiving turkey, and I love that I can tuck a few pies away in the freezer for later in the winter. Pot pie is the ultimate tip-top champion of make-ahead food. Here – let’s walk through it step-by-step. Give cold butter, flour, and salt a few quick pulses with a food processor (it should look a bit like sand!) then add cold water a bit at a time until the dough forms slightly bigger pieces. From there, tip your still-crumbly dough out onto a floured surface and use your hands to gently pat it together. And BAM! You have homemade pot pie dough (although you can for sure use store-bought pie dough if you have some handy). Just drape the rolled pot pie dough over the skillet, flip the edges back in towards the center, and cut a few slits in the middle to let steam escape. For full make-ahead directions, read through the recipe notes at the bottom of this post! 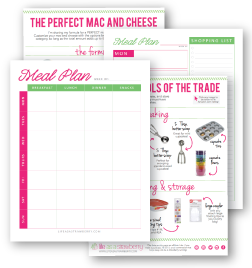 You can prep a few different components ahead of time depending on how much time you have to cook (like I said: the ultimate tip-top champion of make-ahead food). 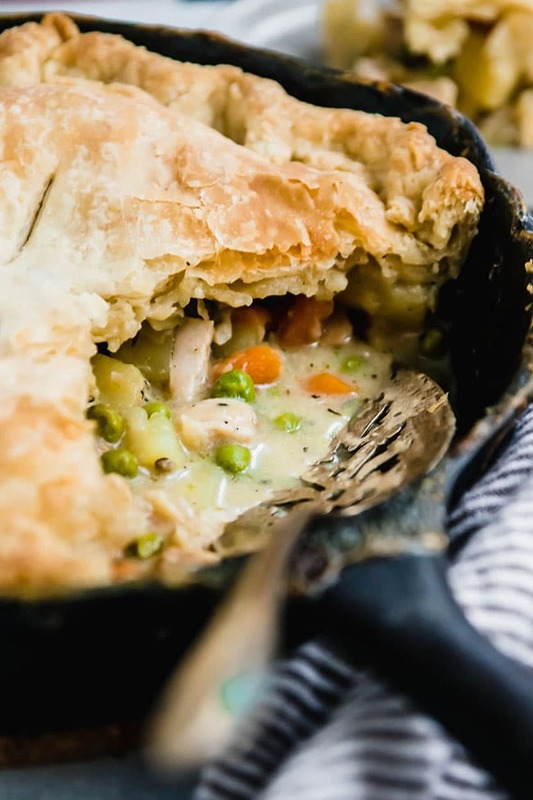 This chicken pot pie is also ultra-customizable, so don’t be afraid to make tweaks based on what’s in your fridge or pantry (there’s that “super-forgiving-recipe” thing again!) I love adding things like fresh rosemary, corn, pancetta, broccoli, or cauliflower. 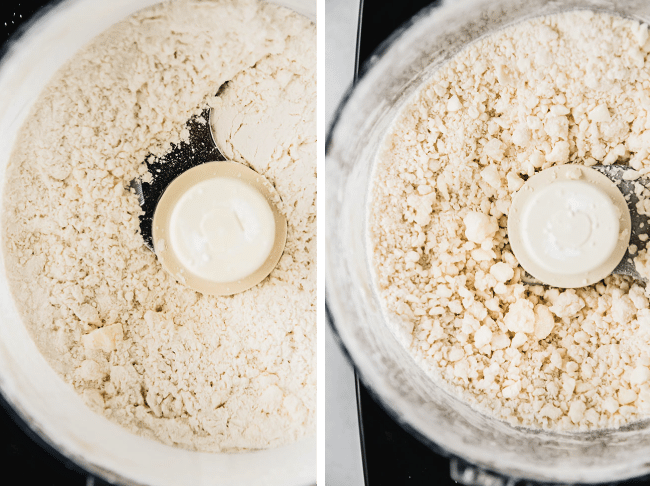 Add cold butter, flour, and salt to the bowl of a food processor. Pulse a few times until the butter has been lightly chopped into small pieces (you should still be able to easily see some butter chunks, and the flour mixture should look almost like sand). Add the cold water a tablespoon at a time, pulsing between each addition until the dough begins to form larger chunks. The dough won’t pull together the way a yeast or bread dough does – it will still look quite coarse. You’ll know the crust dough is ready when you pinch a bit of dough together with your fingers and it holds together without being sticky. Turn the dough out onto a lightly floured surface (it should still look a bit crumbly – that’s ok!). 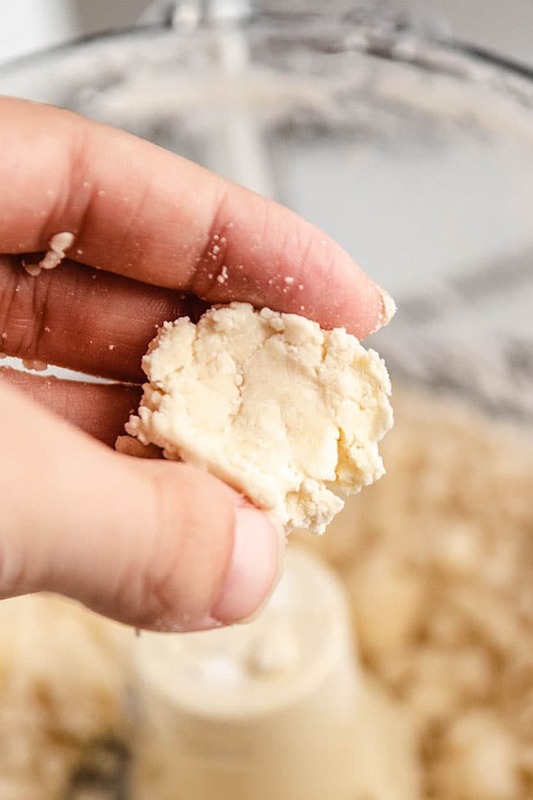 Working quickly, use your hands to bring the dough together (try to “pat” the dough into shape rather than kneading it) until it forms a relatively smooth ball or disc (see the photos above for what it should look like!). Place your dough in an airtight container (I like to use my Stasher Bag, though you could also wrap it with plastic wrap) and put it in the fridge for at least 30 minutes or until you’re ready to use it. MAKE-AHEAD TIP: Make your pot pie crust in advance if you like! Prepared pot pie crust will last 3-4 days in the fridge and several months in the freezer. You can also definitely use a store-bought pie crust here if you like. Melt butter in a large cast iron skillet (at least 10 inches in diameter) over medium-high heat. When butter is melted and hot, add onion and garlic to skillet. Sauté, stirring occasionally, until garlic is fragrant and onion is translucent, about 3-5 minutes. Add potato to skillet and stir to combine. Cook another 3-5 minutes until potato has begun to soften. Add salt, pepper, and thyme to skillet and stir to combine. You should see a bit of butter and liquid in the pan, but if the pan looks too dry here, add another pat of butter or a dash of olive oil. Add flour to skillet and stir to combine. The flour will soak up the moisture in the pan and clump together to form a roux. Cook, stirring occasionally, for about a minute until flour is cooked through and smells slightly nutty. Add chicken stock to skillet a little at a time, stirring in between each addition to break up any lumps. The stock will thicken quickly at first, then gradually thin out. When you’ve added all the stock, bring the filling to a simmer and cook, stirring occasionally, until stock has thickened, about 5-10 minutes. The filling is ready when the stock has reached the consistency of a thick soup. Add carrots, cooked chicken or turkey, peas, and half and half to filling and stir to combine. Return the mixture to a simmer (this is the point where I like to roll out my pot pie crust!) then remove from the heat. If you’re baking the pot pie now, proceed to the next step immediately. 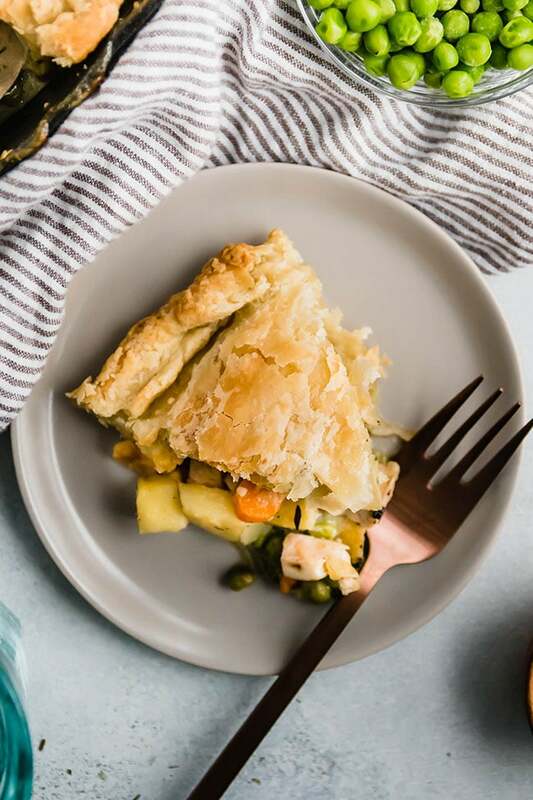 MAKE-AHEAD TIP: If you’re making the pot pie in advance and planning to refrigerate or freeze it for later, let the filling cool completely before moving on to the next step. You can also freeze the filling on its own and make the crust/assemble the pot pie at a later date when you’re ready to bake! Remove pot pie crust from fridge and lightly flour a cutting board. 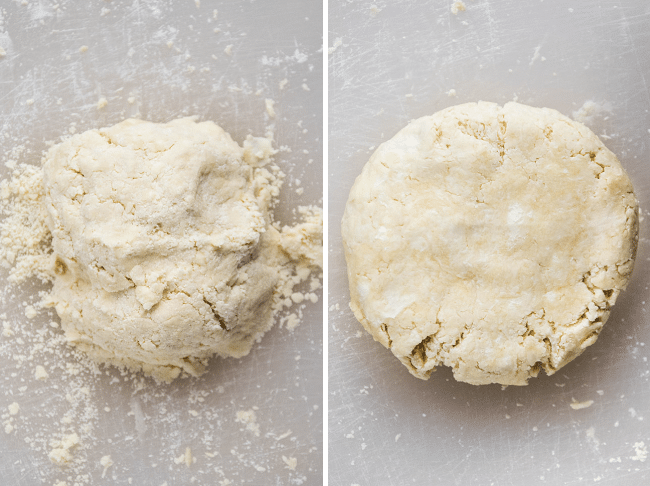 Use a floured rolling pin to roll out the crust to a circle about 1/8″ thick. Your rolled crust should be slightly larger in diameter than your cast iron skillet. Cut slits in the center of the crust to let steam escape as the pot pie bakes. MAKE-AHEAD TIP:If you’re refrigerating or freezing the pot pie, do so now. Cover the cooled pot pie tightly with plastic wrap and transfer to the fridge for up to 4 days or the freezer for up to 4 months. 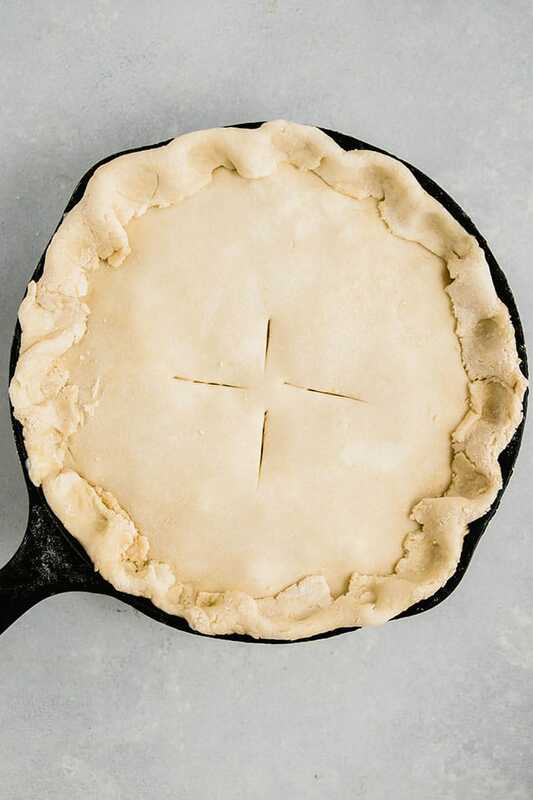 Place your cast iron skillet on a large baking sheet (this makes it easier to move and will catch any drips or spills as the pot pie cooks). Bake at 375 degrees F for 30-40 minutes until crust is golden brown. Let pot pie cool for 10-15 minutes, then cut and serve. This recipe (and accompanying photos) were recently updated to make things easier to follow! 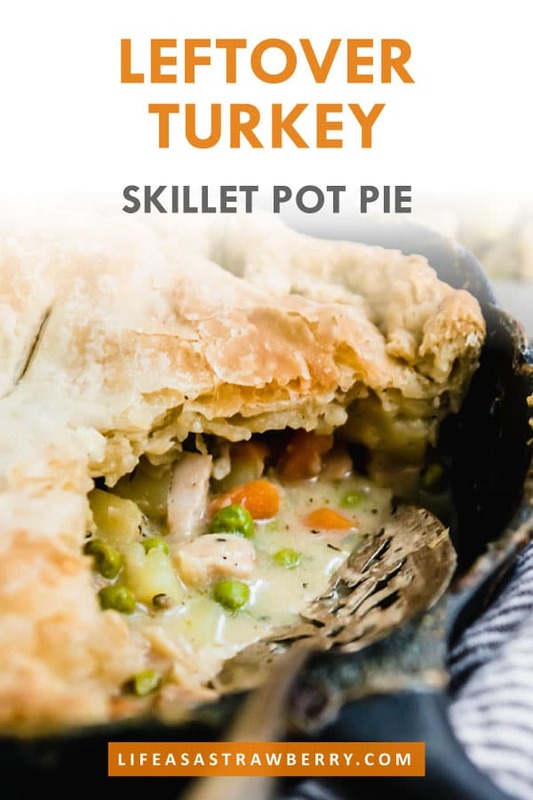 The theme of this pot pie story is “use whatever you have!” – this recipe is VERY forgiving and is a great clean-out-the-fridge meal. Use leftover Thanksgiving turkey or shredded chicken, or add extra protein like bacon, pancetta, sausage, or anything you have on hand. This is also great with leftover fresh rosemary, thyme, or sage, and any extra produce you’ve got. I like to add corn, spinach or kale, brussels sprouts, broccoli, cauliflower, parsnips – you name it, I’ve probably put it in this pot pie. I like to use red or white potatoes here because they hold their shape well once cooked, but use whatever you have! Use at least a 9-10″ skillet for best results (Lodge has some great, affordable ones here). 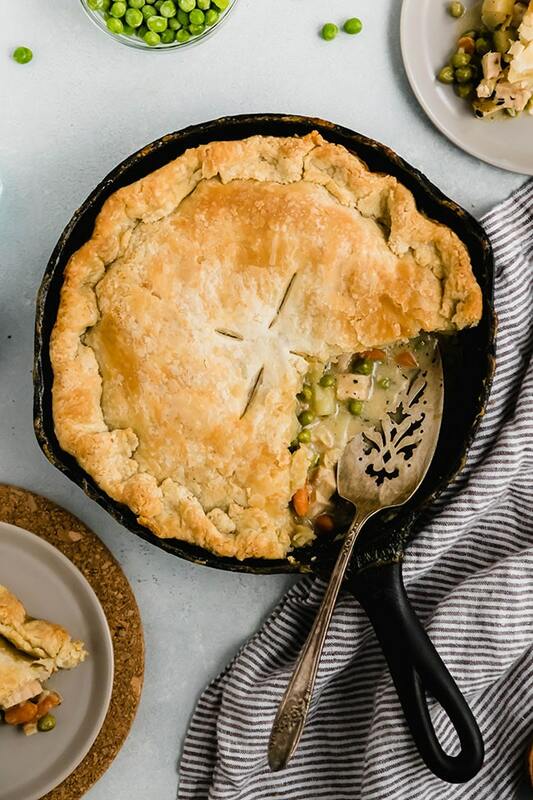 The pot pie should fill the skillet almost all the way up – once you add the last few ingredients, you’ll want to stir slowly and carefully to avoid spilling anything. I find a 9- or 10-inch skillet is usually the perfect size to make a substantially-sized pot pie without overfilling the pan. If you don’t have a big enough skillet, you can always make the filling in a regular pot and transfer it to a separate baking dish to make your pot pie! This recipe also works well using a dutch oven in place of a skillet. Overall the recipe reads fine in your dialog however the printed recipe is quite a bit different. For example in prepping the crust the dialog recipe suggests cold water and the printed version says room temp.! I guess it depends on what your room temp is. =) There are a few other inconsistencies. Your instructions are ususally spot on and the finished dishes are very good. Hi John! We recently updated this recipe and photos, so you may notice a few differences if you’re looking at this post vs. an older printed copy of the original version! 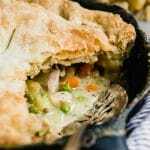 We continually test the recipes on our site and frequently update our recipes if we find a variation or technique that will make them more useful – if you’re looking at a copy of the older version, you’ll notice this updated post also has a ton of new cues and instructions to help you make the best pot pie possible! 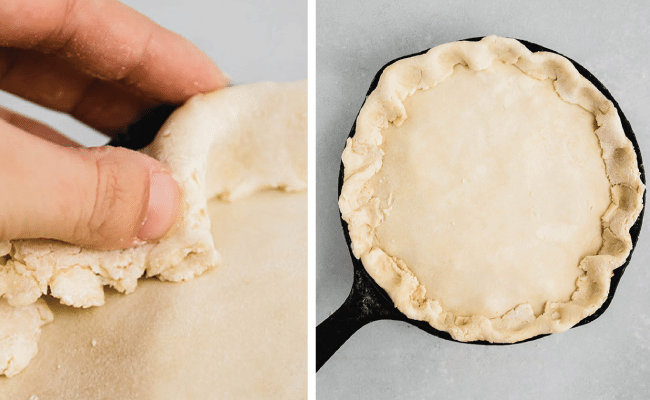 While both recipes will yield a delicious pot pie, we always recommend checking our site for the most up-to-date instructions and recipes. Please feel free to hit that handy “print” button in the recipe box above to print a new copy with the updated instructions!